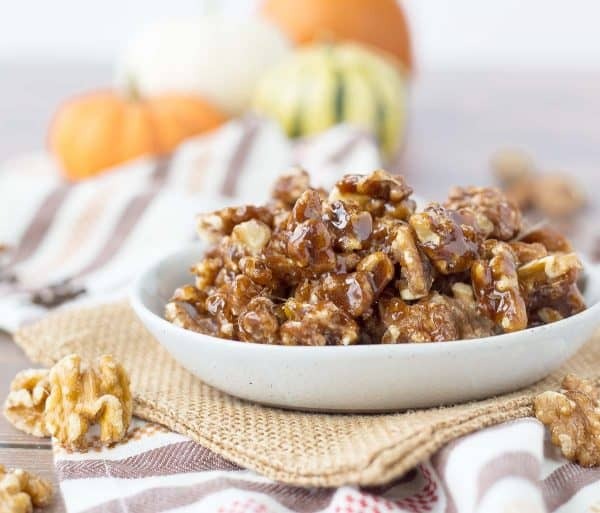 These Pumpkin Spice Candied Walnuts Recipe are the perfect addition to your Thanksgiving table! They’re great on pie, sweet potatoes, ice cream or even yogurt! My favorite way is by the handful. Isn’t there a saying that goes, “Pumpkin Spice and Everything Nice?” Or perhaps maybe that’s not quite right. Sounds pretty good to me though. You know what else sounds good to me? 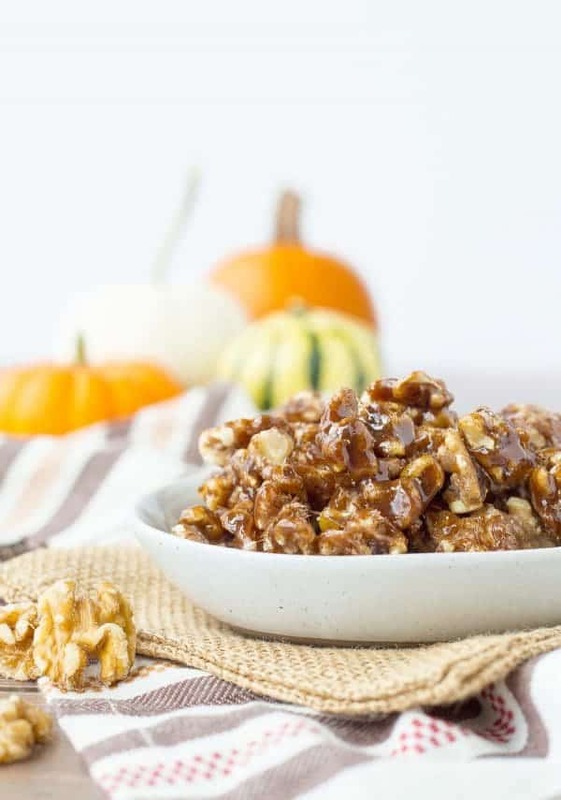 These pumpkin spice candied walnuts, by the handful. They’re full of the flavors of fall that we all love — cinnamon, nutmeg, cloves and ginger. I used my homemade pumpkin pie spice, lots of sugar and a generous touch of salt. The salt gives it a salty-sweet intrigue that will keep you coming back for more…and more…and more. 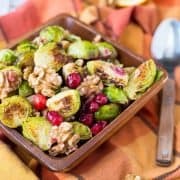 I’m partnering with California Walnuts to bring you a year of nutty and delicious walnut recipes. We’re kicking it off in true fall form — I can’t get enough of all the fall flavors — pulled chicken with cranberries, pumpkin breakfast cookies, ricotta flatbread with squash (and apples! and pepitas! and maple!). These walnuts are pure and simple fall perfection. 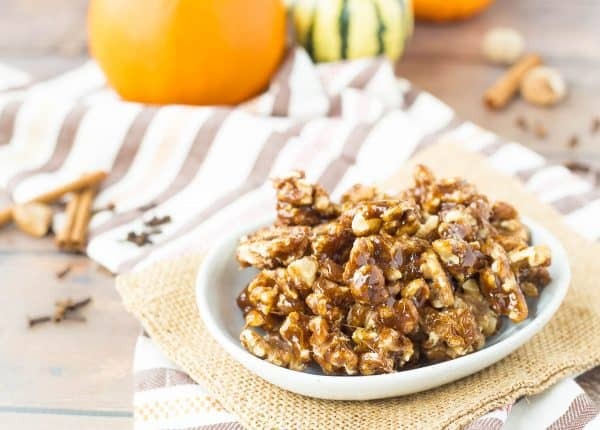 Flavorful walnuts toasted and then coated in melted sugar and pumpkin pie spice. Aside from eating these by the handful, I’d highly recommend adding them to salads, toppings on desserts (pie! cheesecake! ice cream! ), or a sweet potato casserole. I’m willing to bet that if you put these out in bowls at your Thanksgiving dinner, you’ll get requests for them year after year. PS: If you love these you HAVE to try my vanilla bean candied walnuts! 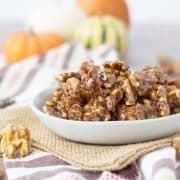 These Pumpkin Spice Candied Walnuts Recipe are the perfect addition to your Thanksgiving table! They’re great on pie, sweet potatoes, ice cream or even yogurt! Toast walnuts in a dry frying pan over medium heat stirring frequently, about 5-7 minutes or until fragrant. Pour onto a large rimmed baking sheet with a Silpat mat or parchment paper. In a medium saucepan, combine sugar, pumpkin pie spice, and sea salt. Cook on medium until sugar melts and is no longer grainy. Remove from heat immediately and add walnuts and stir to coat. Work as quickly as possible as the sugar hardens quickly. Pour walnuts back out onto prepared lined baking sheet and separate walnuts with two forks, again working quickly. If you don’t get them all separated, it’s no big deal, you can cut or crack them apart once they cool. Cool completely before storing in an airtight container. If there are any left — these are irresistible! Note: These are salty — I like the salty sweet combination. If you’re not a huge salt fan, decrease to 1/4 teaspoon or omit completely. Husband’s take: I don’t think the poor guy had the opportunity to try these. Sorry Ben. 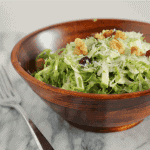 This Candied Walnuts Recipe is sponsored by the California Walnut Board. All opinions are always my own. Thank you for supporting Rachel Cooks by reading about products and food I use and love in my own home. I could seriously snack on these all day long! They look SO good! These would be super dangerous in my house! Ours too! But oh so good! ooh! 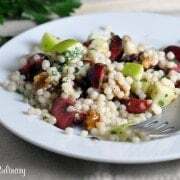 I want to try this on salad with cranberries! Can’t wait. Thank you! These sound so amazing. I love walnuts but never had them candied . Will definitely try this! I bet these would be fabulous scattered over a bowl of oatmeal! My new favorite snack!! I can’t wait to try these! They look really GOOD! !